Egyptian and foreign press flocked to the second floor of the Egyptian Museum on Tuesday to bear witness to the beginning of restoration work on Tutankhamun's gold funerary mask. Two weeks ago restorers removed the mask from its permanent display in the jewellery hall so efforts to restore it can begin after an accident and subsequent botched restoration job a year ago damaged it. When museum officials in 2014 accidentally rocked the mask during a cleaning process the beard became detached from the chin on the mask. They then hastily used the wrong substance to reattach it. In room 55, on the same floor as the mask's permanent display, a team of experts have been examining the mask to ascertain the most appropriate method and substances to use in its restoration. 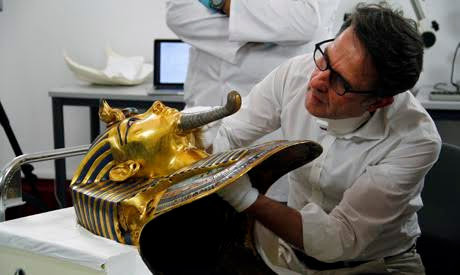 German restorer Christian Eckmann, a project leader, told Ahram Online the team is carrying out microscopic studies on the mask to inspect its condition and work out how best to go about removing the epoxy resin applied a year ago. Eckmann said those studies will be completed next week and restoration will start immediately after. "At the moment I cannot specify a completion date, but it could last 30 days," Eckmann told Ahram Online, adding that safely removing the epoxy resin will require patience. Eckmann and antiquities minister Mamdouh Eldamaty will hold a press conference at the museum on Tuesday afternoon where they will announce details of the restoration project.